Welcome to the website of the Finch Society of Australia Inc. This site is dedicated to all aspects of the keeping and breeding of Australian and Exotic finches. Our site contains articles pertaining to various finch species, interviews with members and general information on maintaining your finches in the peak of great health! Although primarily a Sydney, NSW, based club we boast members in most states of Australia. Throughout the year our meeting agenda is bolstered by interstate and overseas speakers whom cover many aspcts of the hobby. The Finch Society of Australia is one of the fastest growing bird Societies in Australia. Juniors are most welcome and receive help, advice and great encouragement from the "older" members. 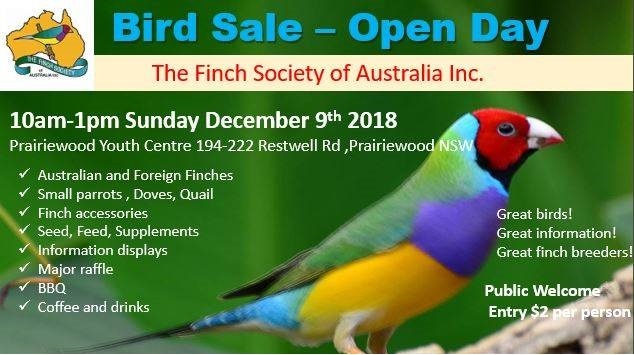 On behalf of our President Maddy Fish, Secretary Brian Read, Treasurer Lyn Wright, Vice Presidents Jason Holmes and Ivan Cindric, and the committee I invite you to enter our website and hope that you take advantage of the opportunity to join The Finch Society of Australia Inc. Welcome!